What has The Commit! Partnership’s backbone Analytics Team been up to? Data Infrastructure: Harvard’s Government Performance Lab is in the process of establishing the first collaboration with a collective impact backbone in the country, selecting Dallas ISD to place a Fellow to enhance data analytics for Early Childhood and/or College & Career Readiness outcomes. Data Capabilities: The 9-month education focused D3 (Data Driven Decision-Making) Institute, led by the Communities Foundation of Texas with the United Way of Metropolitan Dallas and The Commit! Partnership, has selected 16 nonprofits and will commence in October, providing training and coaching resources. Data Partnerships: The Commit! Partnership is providing analytics support and strategic assistance to nascent collective impact efforts in Harris and Tarrant Counties, together with Dallas County representing more than 30% of students in Texas. 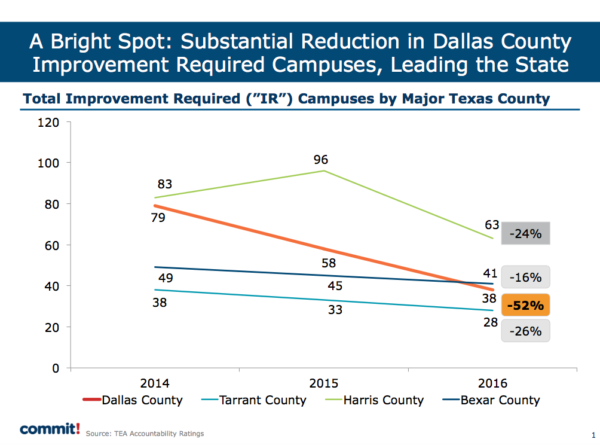 Did you know that Dallas County reduced the number of struggling (Improvement Required) campuses by over 50%? In the last year alone, 13,000 (of which 95% are economically disadvantaged, 35% are Black, 62% are Hispanic, and 51% are English Language Learners) students no longer attend a struggling campus! This progress is a testament to the collective efforts of the community to address our region’s greatest education challenges.